A Wintry Trip to Flagstaff...in May! 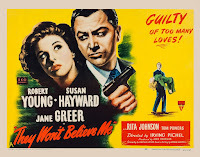 I'd previously seen most of the films at last weekend's Arthur Lyons Film Noir Festival, but the 11 films I watched in Palm Springs were bookended by two first-time viewings, THEY WON'T BELIEVE ME (1947) and THIEVES' HIGHWAY (1949). 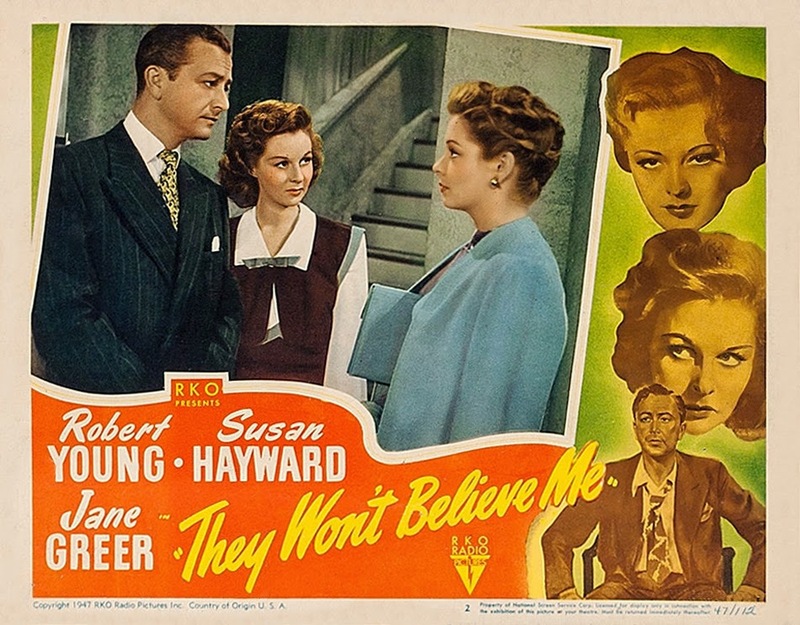 The most enjoyable THEY WON'T BELIEVE ME was introduced by film historian Foster Hirsch, who traveled from New York to participate in the festival. Incidentally, I was glad to be able to tell him that two of his books in the Pyramid Illustrated History of the Movies series, on Elizabeth Taylor and Edward G. Robinson, were among the earliest film books in my collection! Hirsch pointed out that THEY WON'T BELIEVE ME has some rather atypical noir moments, starting with the beautiful waterfall during the opening credits. He said that while the film doesn't always have the classic "noir style" of dark shadows, it does nonetheless have a great hopeless noir mood. Hirsch also pointed out other interesting things to be watching for, such as the strangely rumpled defense attorney (the always-wonderful Frank Ferguson) and the subtlety of Robert Young's performance. Young was superb as Larry, a sort of homme fatale who (perhaps a bit inexplicably) attracts multiple rich and/or attractive women but discards them with seeming ease. 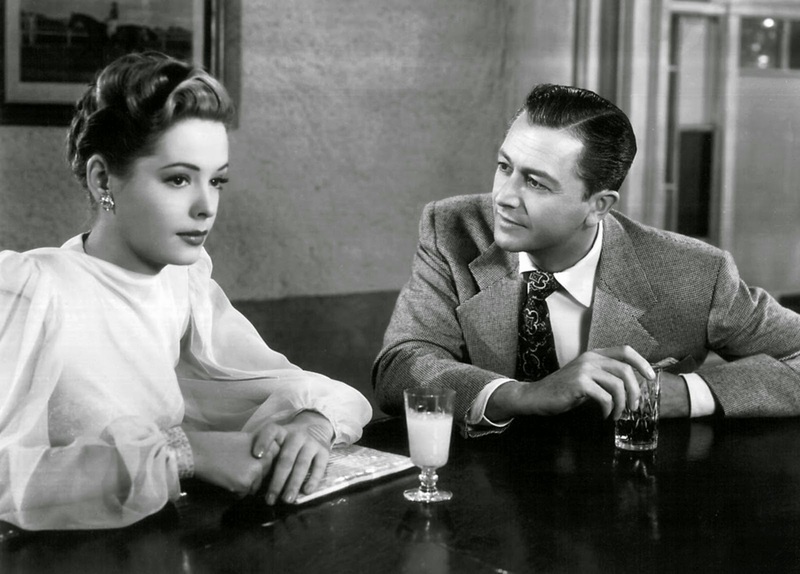 As the movie begins, Larry is planning to leave his wealthy wife Gretta (Rita Johnson) for her lovely friend Janice (Jane Greer, who would next make OUT OF THE PAST). Gretta, anticipating Larry's defection, holds on to her husband with the announcement she's bought him a partnership in a California firm. Larry dumps Janice without so much as a farewell, instead hopping on a westbound train with Gretta. 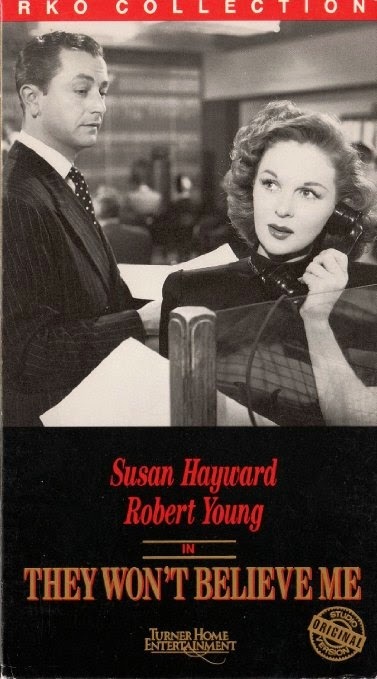 Larry may love Gretta's money, but that doesn't stop him from being attracted to the beautiful and ambitious secretary Verna (Susan Hayward), and once again Larry thinks it's time to move on from his marriage. As he and Verna head out of town together, there's a tragic car wreck and Verna is killed. When rescuers assume Verna is Larry's wife Gretta, he coolly goes along with it...then plans to go back home and get rid of Gretta, which will leave him a wealthy widower with no questions asked. Believe it or not, that's just part of the story, as Larry finds his plans for Gretta become, shall we say, complicated, and later Janice re-enters his life. This was such a fun movie, filled with interesting characters and a few jaw-dropping plot twists. While I may not have quite understood why Young was passionately pursued by so many women, he's wonderful in the role, unafraid to play a smarmy user to the hilt. He might look pleasant, but he's incredibly self-absorbed. As Foster Hirsch pointed out, there are some nice touches in Young's performance, such as the way he slightly grimaces in reaction to Gretta's aunt (Lillian Bronson) in an early scene. Larry's the kind who doesn't bother with telling a woman he plans to marry that everything's off, he just doesn't show up. Even more disturbing, he doesn't take even a moment to grieve the loss of the next woman in his life, instead simply seeing a fresh opportunity to better his situation. In the end, Larry is strictly about No. 1. In the supporting cast Hayward is a real standout as the bright and calculating Verna, who has a terrific introduction, making Larry look good in front of his boss. Hayward is great fun to watch, and I was sorry when her character was so abruptly written out. Johnson, who was seen as the murder victim in THE BIG CLOCK (1948) later in the day, was also quite interesting as Gretta, who is manipulative yet not completely unsympathetic; after all, she's trying to preserve her marriage in the face of tough competition. Greer plays the blandest character in the film, simultaneously a "good girl" and a homewrecker, who bonds with Larry over...deep sea fishing?! 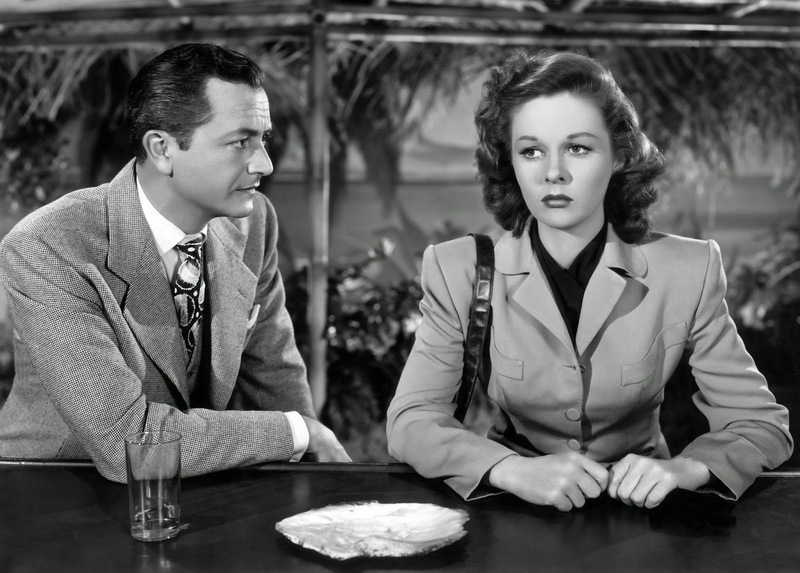 Yet her somewhat passive character's double side seems to hint at the dual personality she would next display more forcefully as Kathie in OUT OF THE PAST (1947). 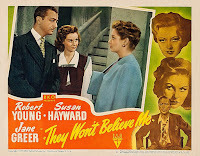 THEY WON'T BELIEVE ME runs 80 minutes and was directed by Irving Pichel, who that same year directed a completely different kind of film, Deanna Durbin's very enjoyable musical SOMETHING IN THE WIND (1947). 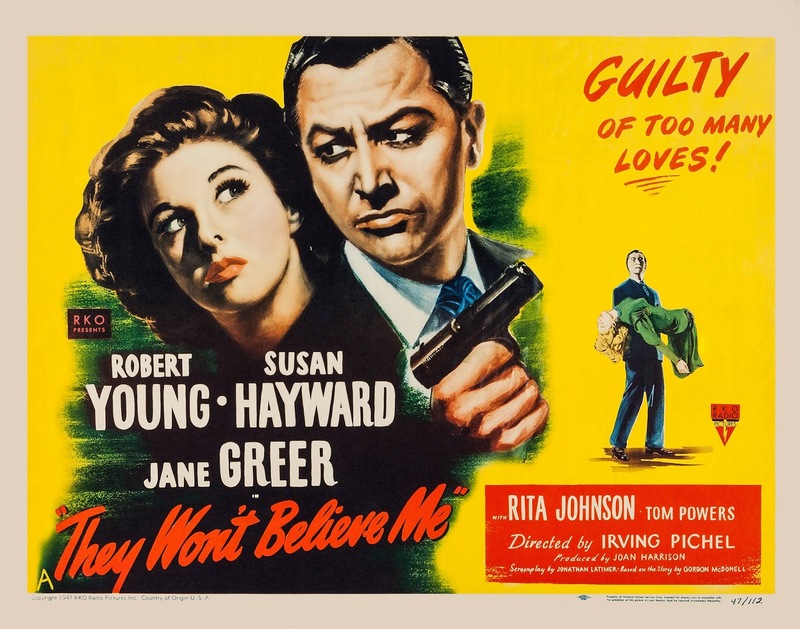 THEY WON'T BELIEVE ME was written by Jonathan Latimer, who had a host of interesting film noir credits, including the previously mentioned THE BIG CLOCK. 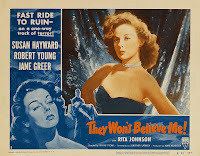 The producer of THEY WON'T BELIEVE ME was Joan Harrison, an associate of both Alfred Hitchcock and Robert Montgomery, and the executive producer was Jack Gross. The UCLA print screened at the festival was lovely. The movie was shot in black and white by Harry J. Wild. I've been trying to find out where the movie's locations were shot, as Gretta's hacienda-style ranchhouse looked like it might have been filmed at Anchor Ranch in Lone Pine. 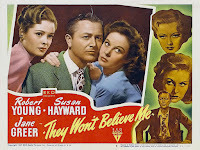 THEY WON'T BELIEVE ME somehow hasn't made it onto Region 1 DVD, though it's been released on Region 2 DVDs in Europe. Hopefully at some point this RKO film will be released by the Warner Archive. It did have a VHS release back in 1990 in the wonderful RKO Collection series. This film was a wonderful start to a weekend of terrific movies! Coming next, an overview of the rest of my first day at the festival. Must have been great, seeing it on the big screen. Seems strange They Won't Believe Me hasn't had a U.S. release. I haven't seen it for ages but will watch it again. 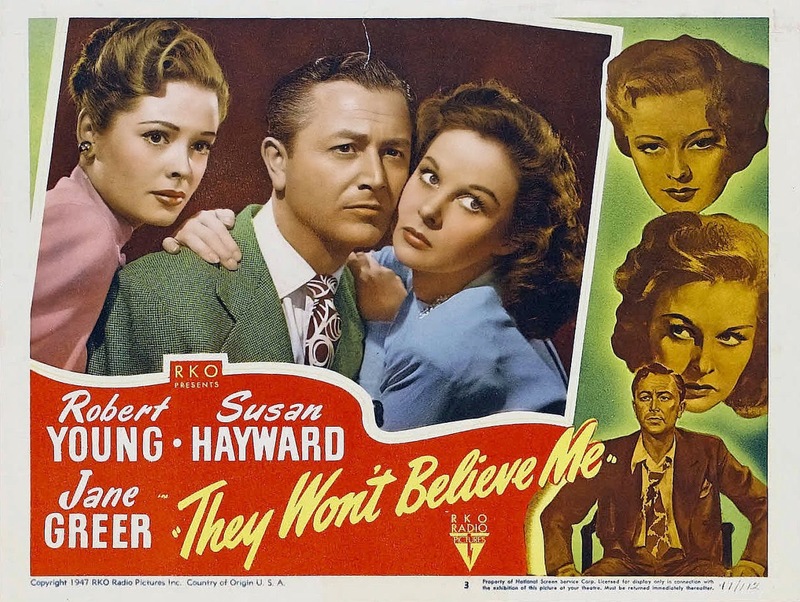 I keep "They Won't Believe Me" on my list of favourite courtroom dramas for that wild ending. The movie is a treasure of things to enjoy. How marvelous it must have been to see it at the festival. You're living the life! Great review and great way to see this! I like it a lot too, really enjoyable, Young is fun to watch and I love that 'homme fatale'-- perfect description. In t he mid-seventies we were staying at The Ambassador, which was being used by an advertising agency, I think for Folger's, to shoot a commercial with young. He was, remarkably, tall and handsome. Totally at odds with the perception from Father Knows Best and Marcus Welby. An incredible presence that was not always, or even often, utilized in the films he made. The actual length of this movie is over 90 minutes. I splurged for the Region 2 version, as I'm a big Jane Greer fan (who, as usual, was sadly underutilized here). I've never seen the 80-minute cut, but I read on another blog (sorry, Laura--haha) that the shorter version omits a lot of important points to the film. Anyhoo, I've also read that the original print needs restoration and that's why it hasn't made it to a Warner Archive Collection DVD-R. Thanks to you all so much for your comments! I'm glad to know this movie has other fans. Vienna, it was a marvelous experience seeing it on a big screen. I find that the movies I see in a theater stand out in my memory in a way other movies don't! Caftan Woman, the courtroom scenes were great, especially as they featured one of my favorite character actors, Frank Ferguson. I'm really grateful for having such wonderful filmgoing experiences! Kristina, I shouldn't be surprised we're in agreement on this film, as we are on so many others. :) What a fun movie! Barrylane, thanks for sharing your impressions of seeing Young in person. Although I was a bit mystified by his ability to attract so many ladies in this film, he has certainly risen in my estimation as I see more of his films. I thought he was particularly outstanding in CLAUDIA (1943). John, it sounds like your Region 2 version was the longer version? Interesting. Alan Rode confirmed to me that the UCLA print screened at the festival was the 80-minute version.